Hey Guys! It’s Wednesday and we are back with another YouTube video tutorial! 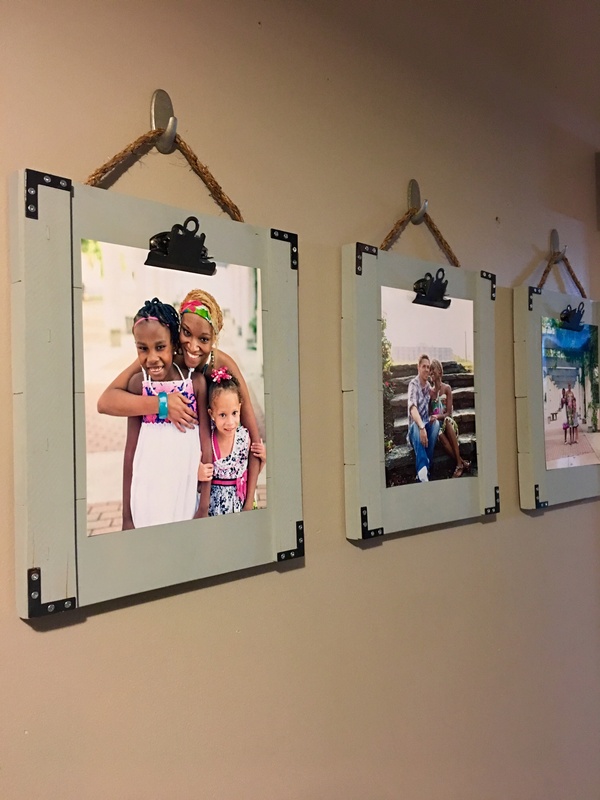 As a mom of 5 kiddos, I am always looking for creative ways to display their pictures that make updating the pictures easy. We have shared lots of clip frames over the years, and this one might be my favorite. Before we get started, be sure to check out the YouTube tutorial by clicking HERE or below! First step is making your cuts. You can download and print the FREE PLANS by clicking HERE! We used one of 3 tools featured in our 3 Tool Project Ebook for this part… The miter saw! Now, run a line of wood glue down each end like this. To keep these in place, attach the two smaller boards down both ends using 5/8″ brad nails with the brad nailer. It’s already time for the finish! We painted ours using an awesome spray paint from Rust-Oleum called Granite. You can find it at Home Depot. While those were drying we painted our silver metal corners. We wanted these to match our clips so we went with a black spray paint on this part. After the frame was dry, we used a bit of rough grit sand paper to lightly distress the edges and corners. After that was all dry, we added a little twine to each frame just to give it a bit more character, and then got them up on the wall. Here they are all finished up! Love this. Will be doing this in my hallway. Where is the black ceiling light from? What size pictures are hung on these? I would love to know how you did the wood wall, what kind of wood it it? Is it stained? Are the pictures just clipped or are they also attached to the wood? Where did you find your craft board for the sides? I’m struggling to find some. I was having the same issue, Michael’s was always out of this size and I was having a terrible time finding them, but I actual found them on complete accident at Lowe’s. They were in a in aisle along the bottom, they have them in pine and oak. I found mine at lowes too! Thank you for the reply. ???? Do you have a tutorial for the wood plank wall? Love this!! what size picture does it hold? How did you attach twine to frame? Those are easy and darlin!!! thank you for sharing!! Can’t wait to try it! Agree, ty!!! How did you fasten the twine though to hang them ? Did you make these? Trying to figure out if you got an answer about attaching the twine. I haven’t made them yet but I ordered the clips and would still like to make them. Do you know how to best attach the twine because I still haven’t heard. I would say tie knots on the ends of the yarn leaving as much of a tail you’d want and staple to the top of the frame. The knots will prevent the yarn from sliding out from under the staple. Thank you! I really appreciate this suggestion!